When the previous version of WordPress was released, not sure which one, since it is updated too frequently, so I am not really sure which version, but definitely 3 +. When that version was released, it also introduced the new Admin grey bar which we will see when we visit our site in the front end, or if we want we can also enable it to view it in our dashboard. Then after a few days it was introduced, many people or wordpress bloggers found it useful, some want to disable this admin bar. I was one of those people who wanted to disable that admin greybar, and some webmasters even wanted to hide it because it slows down the site. (related: admin slow problem). I really thought there was no advantage of admin bar in wordpress 3.1.. When I used wordpress version 2.9.2 (the first version of wp I have ever used) I still remember it was a button called, “Visit site”. I am not sure if you know this, if you are new wp users, but those who have used wp for blogging for a quite long time, that visit button was missing, and actually, I could get used to it quick. However, I still posted a video how to display visit button on WordPress 3+ several months back, because I was curious. Now, surprisingly, that nice button is back with wp 3.2! I am sure you notice the big improvements, such as “visit site”, “add new” of post, page, plugins, etc. The most important for me, as a blogger, is the “Add new” post button. Because I notice the right small “Add new” button next to login or logout button was eliminated in this version, so that button in admin bar is a really huge advantage of Admin bar in wordpress newest version. I have upgraded wordpress beta version to wordpress 3.2, so until today, I have no idea if this admin bar is enabled by default, after you installed wordpress 3.2. But in case, you are having wp 3.2 from upgrade or update and you do not see the admin bar until today, I suggest you to try it for several days, because you can make use of the advantage of admin bar since it is helpful and not disturbing. I enabled mine to only show up only in admin page or dashboard, but not in front-end or whenever I visit my site. 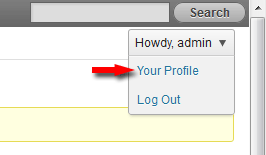 To enable this bar, you can go to “Users” tab in the left, and then your profile, or there is another way, by clicking the “Howdy, Admin” wording, to show a pull down menu, and click the “Your Profile” link. Enable - click "Your Profile"
In your profile page, I would tick the “Show Admin Bar” in dashboard. Of course you can also tick on both to try whether you like it or not. Have you noticed the advantage of admin bar in the current wordpress lately?